Tired, dehydrated, nauseous, feet hurt, legs hurt, fall down, get back up, bleeding, blurry vision. These are the things we feel as mountain-ultra runners shortly after every time we tie our laces and slip out onto those serene trails. What drives us to suffer at that intensity, go home, recover, and then crave it again the next morning? The outsiders (non-runners) look at us and don’t understand why we put ourselves through it. They pity us, when in reality, they are the ones to pity. Most of us have read Born to Run, Eat and Run, Ultramarathon Man, etc. They are all amazing stories about runners doing seemingly impossible things. I crave that. I want to be able to do what most others cannot. 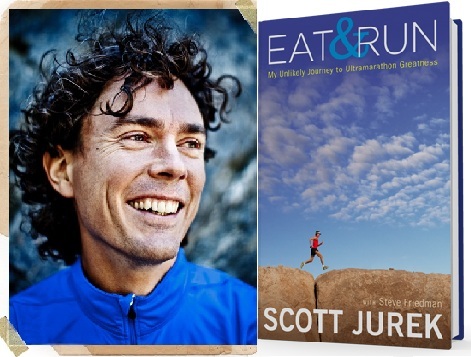 Scott Jurek was first brought to my attention while reading Born to Run and then his book Eat and Run. He had such a desire to win and enjoyed every minute of it. He was a physical therapist and vegetarian, just like me. I felt like I could relate and it made me want to run. He was my first true professional running role model. It’s not always easy, but I really do love how I’m living. It’s a great change from how I used to live. I don’t want to be selfish, I want other people to give it a shot. So that’s what I’m doing. Not selling anything, no special agendas, this is just me letting people know, how to live anultra-life. Everything in our life, in modern society has been done for us. You need some clothes, food, shelter, healthcare, transportation, books, computers…everything we might want, is virtually given to us with very little effort on our part, relatively speaking. And a lot of these things, that we obtain, that we want, aren’t really fully earned in a sense where there’s true accomplishment, where you feel like you’re the master of your own universe, where you’ve created something in your life that you can call your own, that you can be proud of, inception to completion. And it’s a shame, because inevitably people are pretty lost and unfulfilled with their lives. They get the new phone, or the new car; these things don’t bring real satisfaction at a deep, primal level. And for me, ultra-running, is a lot about doing something that inherently we were created through eons of evolution to do, is travel long distances on our own power, using our senses, from our sight, smell, and everything in-between. When you get out in nature, you strip everything down to your bare components of what you are as a creature in this world; ultra-running, especially out in the great outdoors, brings more fulfillment than anything could ever bring. Professional runners certainly bring me motivation by bringing to light what fuels them. We all strive to be like them and likelihood is that we never will, but we try anyway. Scott Jurek, Sage Canaday, Michael Arnstein, Ian Sharman, Anton Krupicka, etc; these are all professional runners that inspire me, that create an image, make a following, and share their experiences with others. I truly believe that they do it for the sport, for the participants of the sport, and not for personal gain (mostly). The real reason why I started running is because of my dad. By watching him, he taught me how to truly love running. He was never the fastest, actually quite slow (5-6 hour marathons), but he loved the sport so much. He found so much enjoyment from simply running, but unfortunately I was not able to share this passion with him. My dad was a healthy eater, avid runner and biker, and lived an extremely healthy lifestyle, but one day he collapsed after biking to work, and died painlessly and instantly at 51 years old. A few months later, a friend of my father’s contacted me and asked if I wanted to run a half-marathon with her in memory of my father. I instantaneously agreed, almost forgetting that the only running I’ve ever done was a few non-competitive 5ks and 10ks, and as a training tool for wrestling. The race was 4 weeks away and I was not prepared. I ran 3 times per week for those 4 weeks and finished the half-marathon in 1 hour 36 minutes. I realized I wasn’t so bad at this, but it sure was painful. Whenever I run, I think about how awesome it would be to be able to tell my dad what I’m doing and where I’m running, to be able to run with him. I think about how happy it would make him, and how proud. The sadness and anger that comes with the realization that I can’t share my passion for running with him drives me to run farther, faster, harder. The anger and sadness is transient, it turns into fuel for running, then brings joy. Running is such a rewarding experience that was brought to light by my father and I will always be thankful for this wonderful gift he gave me, the gift of desire and passion for suffering within nature. (On the left) AJ Cohen, Harvard Pilgrim Half Marathon, May 8th, 2010. (On the right) Eric Cohen, Hamptons Marathon, Fall 2008.